We are supported by vast infrastructural base resourced with advanced production technology. We have production line from J.P. EXTRUSIONTECH LTD. and computerized fully automatic rope making machines from MAHESH TWISTO-TECH. This base facilitates our production team to manufacture complete array of ropes in compliance with international quality standards. Also, we have divided our infrastructural base into various divisions such as procurement, production, quality testing, research & development, sales & marketing and warehousing & packaging. All these divisions work in close-coordination with one another to fulfill variegated requirements of various industries efficiently. Our quality team rigorously tests the ropes on defined quality parameters using modern testing equipment to ensure that an impeccable range of ropes is delivered to clients. Our aim is not only to meet the production dead line, but also maintaining a superior quality standard in the products. Under the supervision of our mentor Mr. Nilesh Chauhan, we have accomplished the altitudes of achievement. He is highly knowledgeable regarding quality parameters and broadly knowledgeable in his respective field. 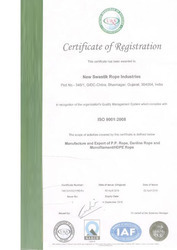 We are an ISO 9001 : 2008 certified company from URS certifications Ltd. UK. Our Company possesses a sound infrastructural setup, which is spread over a sprawling area of land. The unit is segmented into manufacturing, quality testing, research & development, sales & marketing, packaging and warehousing unit. Our manufacturing unit is installed with various advance machines and tools that help us in developing quality products on time. All these machines are lubricated time to time to run the production process smoothly and efficiently. The majority of our products are designed and prototyped with advanced, computer-aided design and manufacturing systems. To achieve the top notch position in the rope market. "Our promoters Mr. Nilesh Chauhan and Mr. Akash Chauhan have been consistently striving hard to achieve the vision and the endeavours for it have led our company to grow manifolds. To achieve the top notch position in the rope market. Our promoters Mr. Nitwit Chauhan and Mr. Nosh Chauhan have been consistently stinting hard to achieve the vision and the endeavours tor It have led our company logrow manifolds.